Stir together the warm milk, melted butter, sugar, and salt. In the bowl of a stand mixer, combine 2 cups flour, yeast, currants or raisins, zested orange peel, allspice, cinnamon, and nutmeg. Then add the eggs and warm milk mixture. With the paddle attachment, mix, gradually adding the remaining flour (more if necessary) until a dough forms. Change to the dough hook, and continue to mix and knead for another 4 minutes or until a smooth, elastic dough forms that pulls away from the side of the bowl. Add additional flour in 1 tablespoon increments as necessary. Although you can skip this step, I like to remove the dough from the bowl to a floured surface and knead by hand briefly to get that smooth texture. Place dough in a lightly oiled bowl and turn to grease top. Cover; let rise until dough doubles (about 1 hour to 1-1/2 hours). Turn dough onto a lightly floured surface; punch down to remove air bubbles. Divide dough into 2 parts and shape into two 12-inch logs. Cut each log crosswise into 12 equal pieces. Shape each piece into a smooth ball and place on a parchment lined or buttered baking sheet. Cover; let rise until doubled, about an hour more. Meanwhile, preheat the oven to 375-degrees. While the dough is rising for the second time, roll out the ready-made pastry very thinly (about 1/8 inch thick) and cut into thin strips. Just before baking, brush buns with the egg wash and arrange two strips of pastry on each bun top to form a cross; trim the ends with the bottoms of the buns. If you’re making an icing cross, skip this step but do brush the buns with egg wash before baking. In a small bowl, whisk together the egg white, water, and sugar. Using a pastry brush, brush the top of each bun with the egg wash.
Bake the buns in the center of the preheated oven for 12 to 15 minutes, or until lightly golden brown. Do not over bake the buns. Transfer buns to a rack to cool. Whisk the ingredients together until smooth. Transfer the icing to a pastry bag (or a sandwich baggie with a very small tip cut in the corner) and pipe an “X” on each cooled bun. 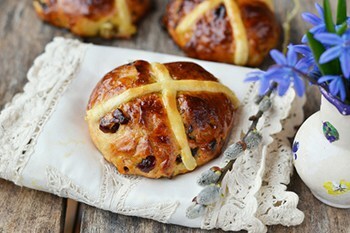 These Hot Cross Buns are easy to freeze. When cool, and before piping icing, wrap in plastic wrap and then foil; store in the freezer. When ready to serve, remove plastic wrap and reheat foil-wrapped buns in a 325-degree oven until warm. If icing, follow directions above before serving. Using a mixer, whip butter, and honey together until smooth. Fold salt in gently with a rubber spatula. Serve soft or at room temperature.